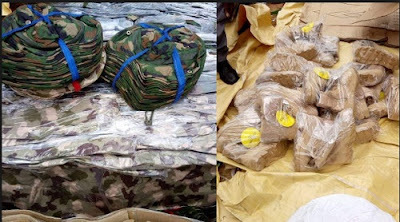 Men from the Nigerian Customs Service seized another false camouflage load in Rivers State just three weeks after the interception of another shipment in the state. Deputy Comptroller General of Customs, Zone C, Port Harcourt, Sanusi Umar, revealed in a statement released Thursday in the state. Umar said about 620 sets of military uniforms and 10,100 military T-shirts were seized this time by officers from the Onne II Customs Zone Command in the Eleme Local Government Zone. He said the main suspect in the import was arrested and currently being questioned. He said: "We are here today to inform you of the ongoing investigation on container number MRSU 3040298 containing camouflage uniforms and military gears. "After describing the importer's transactions, I am happy to inform you that we have stopped another MRKU 4909151 (1 × 40ft) container belonging to the same company, Ehiogocho Nigerian Limited, with Mr. Ongwatabo Jerry as the main suspect. "On examination, it was discovered that it contained 620 fully sewn military uniforms and camouflage caps, 10,100 pieces of indoor military T-shirts, 512 pairs of military jungle boats. "Mr. Ongwatabo Jerry is the only importer who opens Form M for the import of these two containers, and I would like to inform Nigerians that the importation of military clothing by individuals or companies is prohibited by Nigerian law. under customs and excise management laws. " Meanwhile, the outgoing controller of Zone II, Abubakar Bashir, congratulated the officer and commanders for their efforts on the achievements recorded during his stay in the state. He said, "My stay here was great and relations were cordial at Rivers State, so far, I gave myself six months and in the period when we did a lot." We organized the Stakeholder Forum of the oil and gas free zone and we made some changes to the order. "We have met our obligations in terms of non-compliance, my challenges are enormous, the officers and the operators have a great deal of control over the handling and the level of complaints at the training has been very difficult. "This is why our crises have been weak in recent times, the revenues generated during the period were so huge, and the level of imports may have decreased because of the elections. Speaking, the new controller, Saidu Galadima, warned officers and commanders against any act likely to sabotage the war against smuggling, adding that anyone caught would be released. He said: "My major challenge is to measure the achievements of my predecessor, I want to improve what he has accomplished. "We will not have room for traders who do not complain, it will serve to dissuade others from making sure we fulfill our mandate."